Tonight's gig was one I'd been looking forward to since the tour was announced. The Butcher Babies are a great live band, and I'd heard good things about the support act, Sumo Cyco. Canadian band Sumo Cyco kicked the night off, and I quickly realised the people who had told me that they are good live had actually been understating things - Sumo Cyco are absolutely superb live. 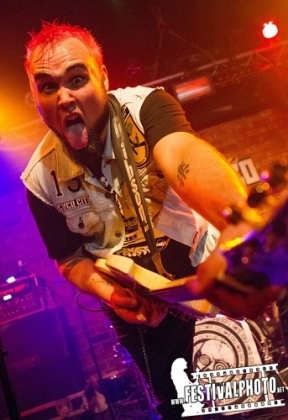 Musically they're very hard to describe as they cross genres and have a really diverse range of influences, but the best description I can think of at the moment is Skindred mixed with No Doubt and a healthy dose of punk and metal. It's a very heavy sound and the mix of genres makes it incredibly addictive - it's the sort of music that makes you want to jump around and have fun. Although the set is primarily their own songs, with most coming from their debut album "Lost in Cyco city" but one coming from their forthcoming second album, they do include a cover - the Red Hot Chili Peppers song "Give it away" which goes down a storm. The live show is also spot on - singer Skye is a whirlwind of energy as she leaps around, dances and generally burns off more energy than most people do in a session at the gym. She's great at engaging the crowd too and spends part of the time on the barrier instead of the stage, and even comes out into the crowd to get the crowd going even more. The rest of the band look to be having a great time too as they put in great performances. The drummer is new and tonight was his first show with the band, but there was no sign of any nerves. They deservedly get a great reception from the crowd. They were so good they justify the ticket price by themselves, and I headed to the merch stand after their set to buy their album. Next up were Butcher Babies. I know how good they are live having seen them several times before, but following Sumo Cyco would be a challenge to most bands. 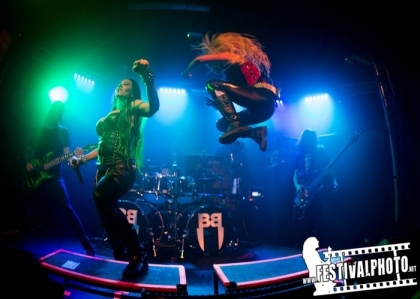 Butcher Babies though rose to the occasion and showed just what makes them so good live. Sumo Cyco have a lot of energy on stage, but Carla and Heidi are phenomenally active, barely standing still for a second. They're constantly running around, leaping in the air, windmilling or headbanging. Couple this ultra-high energy performance with some very heavy music and powerful vocals and you have the recipe for a great set. They play material from the latest album as well as earlier albums, and even do a cover from the covers EP they did - the Napoleon XIV one-hit wonder "They're coming to take me away". It's a song I'd never imagined a band covering but they do an amazing job with it, turning a very odd song into something very heavy and enjoyable. They too get a great reaction from the crowd and we do get some crowdsurfers as well as a mosh pit, and at one point Heidi came out into the crowd and carried on singing while the pit went on around her. Tonight's gig had two bands, either of who are good enough to justify the ticket price by themselves, so the two on one bill made for a very special night. It was so good that once I got home I bought a ticket for the next night on the tour.